This is a word that is easy to pass by in the Bible. It’s only mentioned a few times. Rampart. a broad elevation or mound of earth raised as a fortification around a place and usually capped with a stone or earth parapet. 2. anything serving as a bulwark or defense. 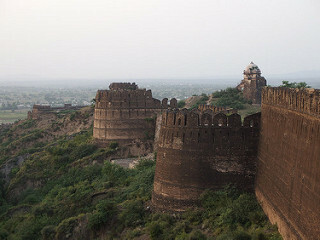 Ramparts were used as a watch tower, a place to see what enemy might be coming. Habakkuk declares he will wait for God’s second answer on the very place that would stop, or at least warn of, an invasion. Here the rampart may or may not be a construction, where Habakkuk intends to actually stand and wait. Whether there is a tangible rampart or not, there is definitely a figurative significance. The rebel in me wonders if Habakkuk was getting all ‘whateverrrrr’ with God. Was he off to the ramparts to stand there all, “Eh like hello? look where I’m standing, a rampart! DUH!” OK, so maybe the ‘whatever’ thing hadn’t arrived in Israel at that stage, but it’s clear that Habakkuk is not happy with God’s first answer and, with a bit of attitude, demands a second one. Despite Habakkuk’s complaining, the invasion did come; no rampart could stop God’s plan from coming to pass. I suppose it’s a lesson in making sure that we don’t rely on our old faithful defences. I’m alright cos I pray, I’m alright cos I read my Bible, I’m alright cos I go to church, I’m alright cos I give. These are things we should be doing – but they are a response to the relationship we have with God – not things we do to earn his favour. Using our prayer life or church attendance as a rampart just won’t do. Our only rampart is Jesus. You want to stop the wrath of God from coming crashing down on your life – then stand on the Rampart, the Rock, that is Jesus Christ. Hi-was just looking up some rampart info; teaching from that Habakkuk passage tonight and found your writing here. Absolutely brilliant. Thank you so much for the encouragement Pastor Heath. Glad you enjoyed it. God bless.